In a city full of venues with self-explanatory names, you pretty much know what you’re getting into with an establishment called Asia Bar. You can even go out on a limb and guess what their interior décor will be like. This reviewer originally thought Asia Bar would be serving only sushi and drinks; but after close examination of the menu, it turns out that the restaurant offers a wide variation of cuisine from various parts of Asia. Surprise, surprise! Located above Applebee’s on the Blue Nile Boat in Zamalek, the place is split into a restaurant and a bar/lounge area where you can wait to be seated. 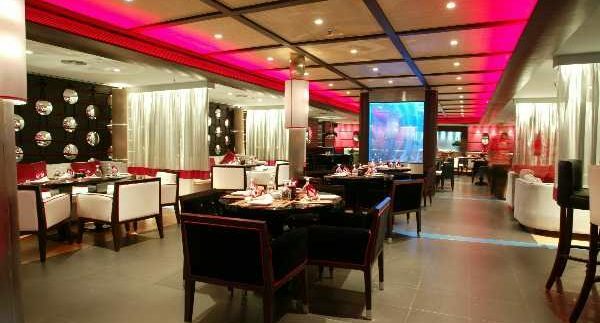 The décor is very modern with hints of Asian design in its panel ceiling and cutlery. Surrounded by ambient colours, black velvet chairs are placed in the centre of the room, with comfy white couches on either side. The place oozes a comfortable vibe that invites a person to relax, dig in and enjoy the food. The menu showcases cuisine from China, Japan, Thailand and India, with (predictable) staples such as spring rolls, and sweet and sour chicken. The crispy chilli beef is a firm favourite; it arrives on a sizzling platter and has just the right amount of spices that don’t overpower the beef flavour. Another recommended main course is the excellent pad thai, while a combination of their spring rolls and shrimp konafa is a filling but very greasy substitute for a main course. It’s somewhat confusing to find chocolate fondant on the Asian dessert menu; but confusion-aside, it might be the best chocolate fondant in Cairo. Yes, it could quite possibly beat Crave’s chocolate fondant. The staff will happily custom-make the fondant into a massive portion for large dinner parties, much to everyone’s delight. For more moderate parties, a meal for two people with drinks averages around 500LE. On the other side of the restaurant, the bar offers the standard wines and cocktails, although their Tsunami Disaster cocktail is legendary with its combination of rum, gin, vodka and tequila. The restaurant is usually jam-packed and reservations are a must, whereas the bar area attracts a smaller crowd of older, calmer patrons. Our only complaint is Asia Bar’s music: something has to be done about their play-list. What can only be described as elevator music plays incessantly through the night, butchering classics as only a cheap hotel singer in a piano bar could. One thing you can predict about Asia bar is that you get your money’s worth in fast service, with quality food in a classy setting; Piano-bar music notwithstanding. Although it’s a great night spot, don’t pass up the food. Customers may have to endure slow service in the lounge.